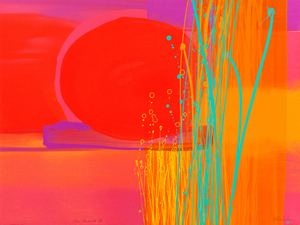 I have just completed two new screen print editions, Clear Moment I and II. These have been hand printed by myself at my studio in Cambridge. 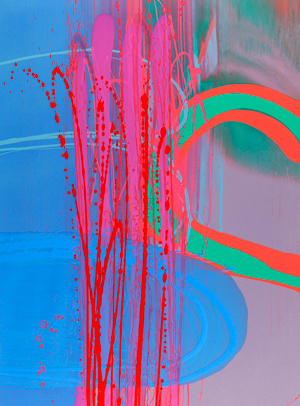 They each have 13 colours printed, with two overprinted gloss colours, in an edition of 80. For images of them, please go to Prints. Charlotte working on 'Clear Moment II'. On the 24 October there will be an auction at Anstey Hall, Trumpington, Cambridge, to raise funds for the charity Flying Kites, I have donated the print, Equating I, to the auction. 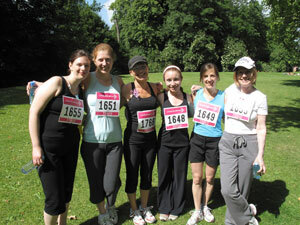 On the 14th June, I took part in the Race For Life charity running event, running with the staff from Cambridge Contemporary Art. We had hoped to raise £3,000 for Cancer Research UK, but had so much support that we exceeded our target. Thank you to everyone who so generously sponsored us! 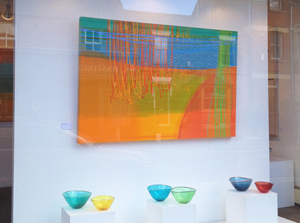 Thank you to everyone who bought raffle tickets for the Charity Raffle that took place in memory of my aunt, Rosemary Halman, at the opening of 'Joining The Dance' at Cambridge Contemporary Art. Having sold 300 tickets, the raffle for 'Treasured I' raised an amazing total of £1,500 for Cancer Research UK. 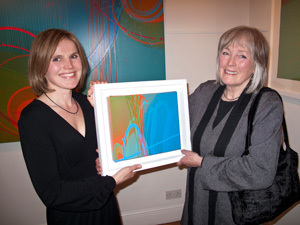 It was particularly special that the painting was won by my other aunt, Stell, Rosemary's eldest sister. During the next couple of months, I will be working on two new screen print editions. I will be hand printing these new editions at my studio. Images and details will be put onto the Prints page as soon as the new editions are completed. I have donated a framed copy of the Limited Edition Original Print, 'Venturing I', to a charity auction - Celebration of the Arts - raising money for the Prince's Trust. 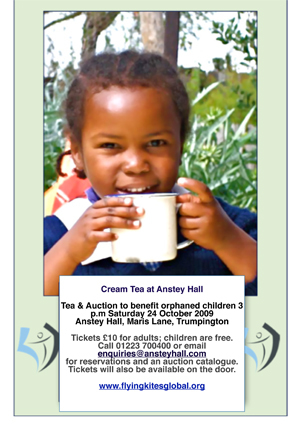 The event has been organised by Bidwells and is to be held at Trinity College Great Hall on 9th December. Please follow the link above for more details. I have now completed the new series of editioned etchings, 'A Good Day I-IV'. Each print is made from two etched copper plates overprinted, with an additional screen printed mark on top. 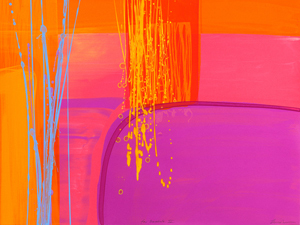 They are each made in an edition of 100 and are priced at £250 each. Images of all four prints can be seen on the 'Prints' page. 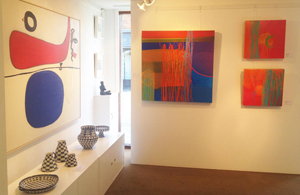 At present, they are available directly from myself or from Cambridge Contemporary Art. I was selected as one of ten artists working in the East Anglia region, to be commissioned to produce a work on paper for Nuffield Health. The artwork I have made, 'Vita', will become part of their collection but the image will also be used as a hoarding display during the construction of their new hospital building on Trumpington Road, Cambridge. 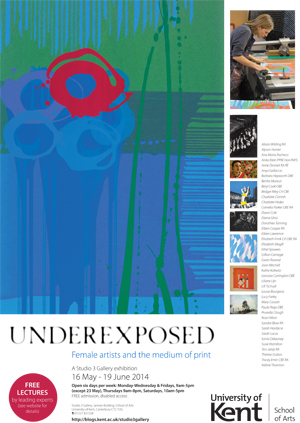 From the 16 May until 19 June some of my prints will be included in the exhibition 'Underexposed: Female artists and the medium of print', at the University of Kent, Canterbury. I feel privileged to have been selected to be part of this exhibition which includes prominent women artists who have used the medium of print during the 20th and 21st centuries. For the list of exhibiting artists, please click on poster. Over the past few months I have been working on a series of new monoprints at my studio. After initially monoprinting the backgrounds on my screen printing table, I then stretch the paper onto large boards which allows me to paint on top with acrylic paint with the paper staying flat. I really like the combination of the qualities of the printed background marks, with the raised and more painterly marks added on top. Some of these new pieces of work will be exhibited in the summer exhibition at Cambridge Contemporary Art during July and August, where I am their 'Featured Artist'. There will also be some pieces exhibited during my Open Studio weekends, 4,5 & 11,12 July. 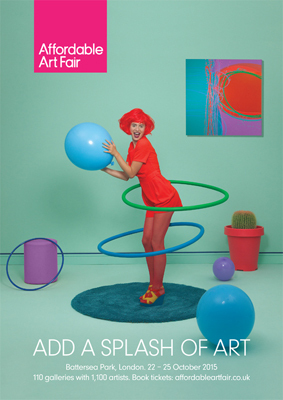 One of my most recent paintings, 'Haven I' has been used in the advertising for this autumn's Affordable Art Fair in Battersea, London, 22-25 October. A selection of my paintings will be with Byard Art on stand H12. Please contact Byard Art if you would like to attend as there some limited complimentary tickets available. I have recently completed several new series of mono prints. Most of these have been selected for a project by a corporate company. I am interested in developing this way of making images to create some small limited editions of screen prints, predominantly using the monotype process. I hope to have some of these completed and exhibited at this year's Open Studio in July. 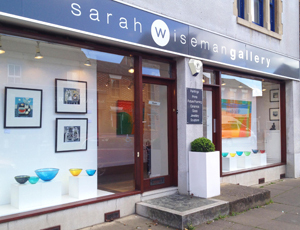 Sarah Wiseman Gallery in Oxford. The exhibition is open until 29 April. 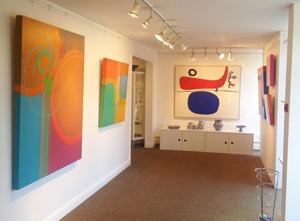 A few of the new paintings are currently being exhibited at Byard Art, Cambridge. I have also just completed a series of twelve new mono prints/works on paper which will be exhibited at Cambridge Contemporary Art during April. 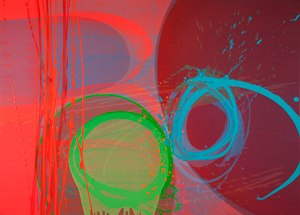 Here are two from the new series, Medina III, (I/II), and Medina IV, (I/II).